To produce fire, three ingredients are needed: Oxygen, fuel, and a heat source. To set a piece of wood on fire, we have fuel (the wood), we have Oxygen (in the air), but we need a heat source. To do this, one way to create heat is by using friction: rubbing the fuel with another piece of wood. With enough heat, the Oxygen furiously grabs on to the Carbon in the wood, releasing intense heat. This heat causes the spot on the wood next to the rubbed part to catch fire, thus chain reacting throughout the entire piece. The flames are created when the impurities in the wood turn to vapors, and glow as they pass up through the heated area. In matches, the phosphorus reacts with the oxygen with less heat than carbon needs, therefore matches are much easier to use. In making charcoal, with only a little bit of heat in the process, it is enough to steam or burn out excess water and other particles that would leave a fuel much hotter than plain wood. This charcoal was perfect for blacksmithing. 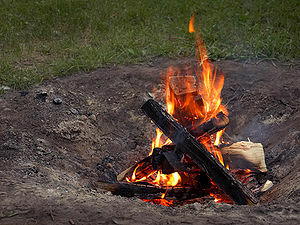 The hottest part of a wood fire, in the small cracks at the center, it has a maximum temp. of 900-1200 degrees farenheit, and just when you get to the flames above, it goes 300-400 degrees. Coal, on the other hand, is normally around 900-1000 farenheit, and a regular 1200 degrees with a small draft. This entry was posted in Uncategorized and tagged 1000-1500 AD, blacksmith, carbon, charcoal, combustion, Fire, middle ages, oxygen on January 26, 2012 by Captain Belaq. In the middle ages, both the Blacksmith and the Smelter needed extreme heat for their work, much hotter than that produced by wood, so how can these people obtain this? The answer is charcoal. 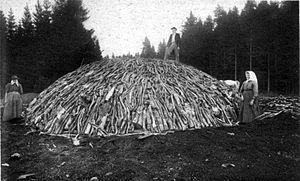 Approximately 20 ft. of ground is cleared of vegetation and around 3 tons of wood are gathered and stacked in the shape of an igloo. The stack is then covered in dirt except for a small hole on top. The wood is then set on fire, well sort of on fire; the wood just smolders. 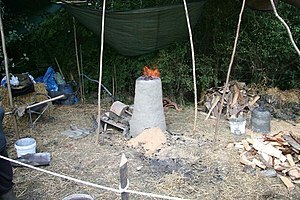 The charcoal burners then must watch for a few days and make sure it doesn’t burst into flame. Inside, the wood smolders and smokes away all the moisture and other un-burnable stuff, and finally the charcoal burners rake away the dirt and ashes to reveal the charcoal, which is then sent away to the blacksmith, smelter, and rich people who can afford charcoal for heating. This entry was posted in Uncategorized and tagged 1000-1500 AD, blacksmith, charcoal, coal, Iron, Smelting on January 23, 2012 by Captain Belaq. When Iron ore is mined, it is grains of Iron sand in regular earth; utterly useless to the medieval people unless separated. This process is called smelting. First, these people would dig a circle in the ground about a foot deep and three foot in diameter. They then would build up clay about 6 in. thick around the edge of the hole. When reaching ground level, a pipe is inserted, and the clay is slowly built up and packed firmly on until it is three to four feet high. Straw is then packed inside and burned to bake the clay hard. Finally, when all this is done, a layer of straw, grass, wood, etc., is put inside, and then a layer of Iron ore, then more burning material, and so on. With a bellows pumping into the pipe, the wood is set afire and is kept burning for around 24 hours, during which time the impurities in the Iron ore, called slag, melts and separates from the pure Iron. When it cools, the chunks of Iron are ready to be sent to the blacksmith. This entry was posted in Uncategorized on January 16, 2012 by Captain Belaq. Nearly everyone has heard of Damascus Steel, but this is not a super-metal. Damascus steel is just the name of two types of steel folded together to make a strong (for the time) blade. Now, how Damascus Steel is made is first, the bladesmith hammers flat several pieces of higher- and lower- Carbon steel. Then he places them alternately one on top of the other: Higher carbon, then less carbon, then higher, then lower, etc. They are then heated, hammered flat, and folded in half. This process is repeated several times, doubling the amount of folds each time. This alternating between hard, brittle steel and soft, strong steel made the Damascus blade considerably strong; the strongest known to Europeans at the time. Once the Bladesmith is satisfied with the amount of folds, he hammers it into the shape of the blade. Before the metal cools, the bladesmith dips it into some acid (or oil), cooling it quickly, which hardens the steel. The type of steel in the knife that has either more or less (I don’t know which) Carbon reacts with the acid faster than the other type, and therefore turns black, showing the trademark swirling layers. The Crusaders first saw these strong blades in Damascus, on their way to Jerusalem, so resulting in the name: Damascus Steel. Actually, these blades were developed around India, gradually brought by traders through Persia to Damascus. This entry was posted in Uncategorized and tagged Bladesmith, Crusader, Damascus Steel, Metal working, Steel on January 10, 2012 by Captain Belaq. The Celts inhabited most of Europe, and were thought by other civilizations, such as Greece and Rome, as complete barbarians. The Celts were, politically and socially, unorganized. They knew no cattle herding or farming, but, the British Celts were very skilled in metalworking, especially silver. In fact, I read that the Greeks learned Iron working from the peoples north of them, which is approximately where the Celts would have dwelt. Tin was found all over Britain (the reason the Romans conquered the island), and Iron, Silver, and Copper were relatively abundant, so the Celts had plenty of material. Though Gold was mined out much earlier on, so this metal was scarce. 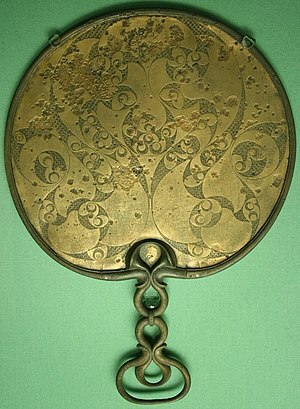 The Celts would decorate bowls, plates, and their great weaponry with scenes of their gods and Heroes. As Christianity spread, Crosses and signs of the Crucifixion replaced the pagan scenes, and trade with the Holy Roman Empire increased, the British Celts became one of (if not the) best silversmiths in Europe. The Celts normally did their work with several pieces of metal, soldering or riveting the pieces together, instead of doing it with a single piece. For figures or statues, the smith would cast a general shape of the figure in bronze, then shape and etch several plates of metal, which were then riveted on to the pre -cast figure, and polished down. Voila! a beautifully done statue! This entry was posted in Uncategorized and tagged Celts, copper, Silver, Silversmith on January 10, 2012 by Captain Belaq. 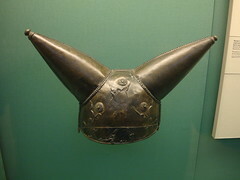 The Celts used the same metal techniques as other civilizations, but the Celts do not seem to like rules. You know what a Celtic knot looks like: swirling, flowing, never ending. When introduced to Roman art, the Celts decided that the Roman ways were more popular, so they copied the Roman style: strait lines, strict measurements, and so on. Gradually, the Celts went back to their engravings of enormous bunches of hair and unending designs. 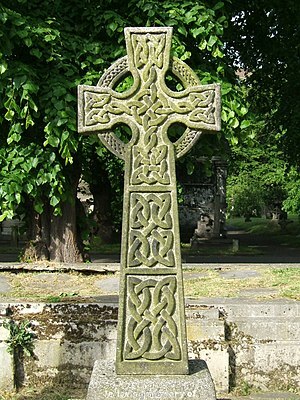 As Christianity spread, however, the Celts combined the Cross with their curves and swirls, and came up with the Celtic Cross. This entry was posted in Uncategorized and tagged Celts, Metal working, Rome on January 3, 2012 by Captain Belaq.